1. 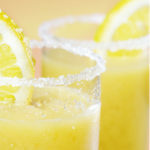 Place all ingredients except garnish in blender; process until slushy and ice is finely crushed. 2. Pour into a 12 oz. glass and garnish.